FarFarOut is part of a class of objects named extreme transneptunians objects. Other objects in this category all have a very eccentric orbit. This is why some researchers believe that a massive object has disturbed these orbits or continues to do so. This is the hypothetical planet 9, also named planet X. There is however no consensus on its real existence. Many alternative explanations have been proposed, including the hypothesis of a transient disturbance, for example another star that would have passed close to the solar system. It would have disrupted the orbit of many celestial objects, including extreme transneptunian objects. It is interesting to look at similar case outside the solar system. 300 light years from us, the HD 106906 system orbits around a binary star. We know a huge planet in this system, eleven times more massive than Jupiter. It has been observed by direct imaging. The two stars also have a large disc of asymmetric debris that orbits at a distance quite similar to the Kuiper belt. The planet’s orbit is very eccentric. It passes close to the two stars before moving away to more than 700 astronomical units of them. It is unlikely to have formed in this orbit. A study published on February 28, 2019 attempts to explain this phenomenon. Both researchers believe that HD 106906 b formed in a circular orbit. 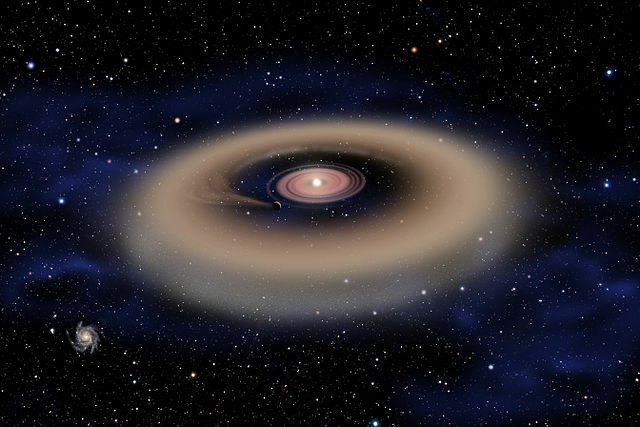 According to the standard formation model of planetary systems, gravitational interactions with its two stars would have gradually disrupted its orbit, making it more and more eccentric. In fact, the gigantic planet should have been expelled from the planetary system, but it was not. That’s what’s interesting. The two researchers believe that it is the passage of another star near this system that has stabilized HD 106906 b in its current orbit. They even identified some suspects. This hypothesis is interesting for our own solar system, and a hypothetical planet 9. If a planet X really exists, it is massive and very far from the sun. This does not really fit with the standard formation model of planets, but as HD 106906 b, this planet X could have formed inside the solar system. As a result of gravitational interactions with Jupiter, it would have been catapulted into a very eccentric orbit and never return to the interior of the solar system because it would be stabilized at a great distance from the sun by a nearby star. From this distant orbit, it would disrupt the trajectory of certain Transneptunian objects like FarOut. But this is only a hypothesis. HD 106906 shows that it is interesting not to study in isolation each planetary system. Stars can pass close to each other, especially during their youth. In December 2018, we learned of the discovery of Farout, the most distant planetoid to have been discovered in the solar system. Located at more than 100 astronomical units of the sun, this object evolves two and a half times farther than Pluto. 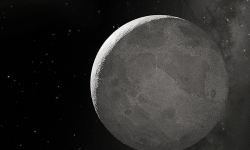 It is part of extreme transneptunian objects. These objects fuel for some years speculation about the existence of a ninth massive planet. To solve this mystery, the best method is to continue to discover new ones. That’s what astronomer Scott Shepard and his team do. They had discovered Goblin and Farout last year. A few days ago, they announced the observation of an even more distant object, named FarFarOut. It evolves to 140 astronomical units of the sun. For the moment, astronomers have not yet been able to calculate its orbital parameters or apparent diameter. It is therefore impossible to know if it has a very eccentric orbit, compatible with the hypothesis of a ninth massive planet. With our current scientific instruments, it will be difficult to observe even more distant objects. It should be noted that since these objects are in very elliptical orbits, they can move away to hundreds or thousands of astronomical units of the sun. It will therefore be necessary to wait for additional observations to determine FarFarOut’s orbit. A trio of astronomers has just announced the observation of the farthest object ever discovered in the solar system. This record is responsible for its nickname, Farout. It is an object of 500 kilometers in diameter, which would be enough to consider it as a planet. Farout is currently evolving at 120 astronomical units from the sun, that is, four times farther than Pluto. Farout has a spherical shape and a slightly pinkish color, which indicates that it is mainly composed of ice. 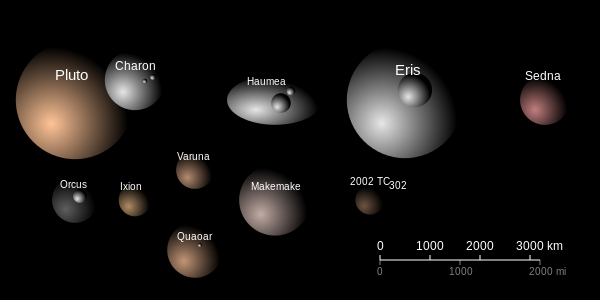 Farout was observed as astronomers sought to discover Planet X, a planet still hypothetical but which could explain the highly elliptical orbits of some transneptunian objects. Farout can not be this planet because it is not massive enough. Astronomers who made this discovery do not yet know its orbital parameters. We do not know if Farout’s orbit seems to influence a massive outer body. Farout is so far away that it will take several years to determine its orbit. It’s the same team of astronomers who discovered the Goblin in October. The Goblin’s orbit is very eccentric. This object passes too far from Neptune so that it can be responsible. This is why some astronomers are looking for another planet that could explain these disturbances. Whether this planet X exists or not, this hunt makes it possible to discover new objects that can claim the status of dwarf planet. At this pace, we will know several tens within a few years.